I do like a good bit of speculation, rumour, gossip and innuendo, so of course all this reshuffle reporting is getting me rather excited. There have been a number of articles playing the guessing game about what a new Brown cabinet might look like post-Euro election bruising. 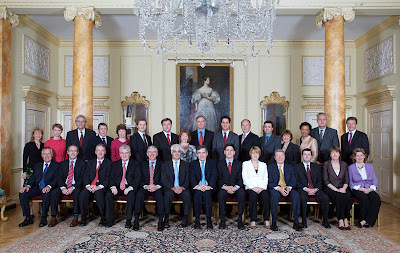 Of course two months is an eternity in politics and no one knows how the new Cabinet will look. Last year Gordon Brown couldn’t possibly touch the presumptive next Labour leader. Then came the banana picture and the Kashmir gaffe. Is he now weak enough to be shifted in to a career destroying stint at the Home Office perhaps? We all know Ed Balls has his eye on the role of Chancellor. But shifting Ali D this deep in to a recession after staking so much on the budget would be seen as an admission of guilt over the state of the economy. But could an economic mea culpa be just the trick Brown needs? I will be shocked if Jacqui Smith remains at the Home Office following the June reshuffle. She has been criticised for her performance as Home Secretary and ridiculed for her expense claims. Keeping her at the Home Office would risk overshadowing all other moves in a reshuffle. A stint at DCSF was supposed to soften up the image of the all too wonkish Ed Balls. Instead there have been the SATs fiasco and the difficult introduction of the new diploma qualifications. Hazel Blears would be a fiery opponent for the excellent Michael Gove. Lammy has been at DIUS since June 2007 and was promoted to Minister of State and made a member of the Privy Council. P.S. did you know he's friends with Barack Obama? Yvette Cooper has been a high profile voice at the treasury throughout the credit crunch, passionately advocating for strong government action to help people through financial difficulties. Well liked and well regarded across the health profession, I would expect Johnson to stay on. The only other prospect might be Home Office? And yes, I should get out more. Is it an overused cliche to say rearranging the deck chairs on the titanic? I thought the rats jumped off the sinking ship? You didn't say who you think the Prime Minister will be after Labour struggles to barely finish third in a national election. I am gonna predict labour gets its worst ever national results.